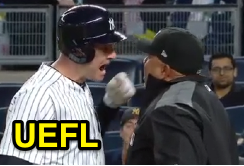 HP Umpire Adrian Johnson ejected Yankees 3B Chase Headley (foul ball call/HBP no-call) in the bottom of the 7th inning of the Astros-Yankees game. With two out and none on, Headley attempted to bunt a 0-1 cutter from Astros pitcher Will Harris for a foul ball. The pitched ball made contact with the area in which Headley held the bat as Headley attempted to pull the bunt back; New York declined to challenge the play. Replays do not suggest the pitched ball solely and initially contacted Headley's hand, the call was correct. At the time of the ejection, the Astros were leading, 4-0. The Astros ultimately won the contest, 5-1. This is Adrian Johnson (80)'s first ejection of the 2017 MLB regular season. Adrian Johnson now has 4 points in the UEFL Standings (0 Previous + 2 MLB + 2 Correct Call = 4). Crew Chief Eric Cooper now has 1 point in Crew Division (0 Previous + 1 Correct Call = 1). This is the 34th ejection report of 2017. This is the 13th player ejection of 2017. Prior to ejection, Headley was 0-2 (2 SO) in the contest. This is New York-AL's 2nd ejection of 2017, T-4th in the AL East (TOR 4; BAL, TB 3; BOS, NYY 2). This is Chase Headley's first ejection since September 15, 2014 (Marty Foster; QOC = Y [Balls/Strikes]). This is Adrian Johnson's first ejection since May 21, 2016 (Kevin Long; QOC = Y [Balls/Strikes]). Wrap: Houston Astros vs. New York Yankees, 5/12/17 | Video via "Read More"